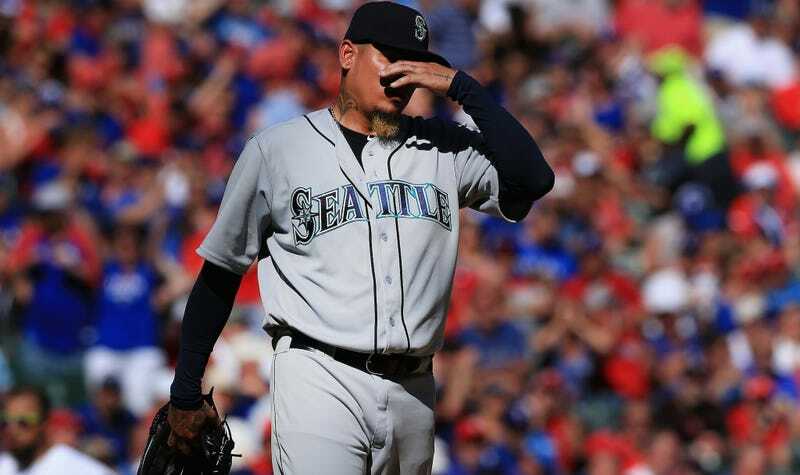 Felix Hernandez is one of the best pitchers working today, and until this afternoon, he’d never lost an Opening Day start. Thanks in part to the King’s dominance over the past half-decade, the Mariners had a chance to become the first team since the 19th century to win ten straight openers. But the Rangers beat them 3-2, despite Hernandez and the Mariners only allowing a single hit. Texas scored all their runs in the bottom of the fifth, right as Seattle’s infield forgot how to play defense. First, Kyle Seager dropped a grounder and allowed Elvis Andrus to reach first. Then, Hernandez walked Shin-Soo Choo with the bases loaded to put Texas on the board. A blooped Prince Fielder single and a Ketel Marte error later, and Seattle’s goose was cooked. Hernandez picked up three runs (one earned), the loss, and made history. Ten Rangers reached base, and nine of them got there for free. In issuing a career-high five walks and hitting Delino DeShields with a pitch, Hernandez is nearly 10 percent of the way to his 2015 total of 67 free baserunners allowed. If Seattle wants to make any noise in a competitive AL West, they’ll need to make King Felix’s starts count better than this.